Today, my wife replied to a tweet of mine and a few minutes later, I noticed an odd retweet of her response. Without the context that I was wrestling with Microsoft Office’s bulleted list implementation, it didn’t make a lot of sense to RT. Something only a bot would do. Another curious element was that the retweet by “unixland” was made with the Perl Net::Twitter package, not by any recognized twitter client. Suspicious. A quick check of unixland’s feed shows a fair number of retweets that seem to have little common thread, and then liberal inclusions of links to “Computerhulp” in Amsterdam, and the owner’s personal photography website. Bogus. 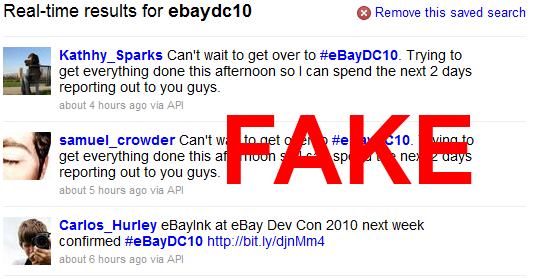 This got me digging a little deeper, and I clicked on the hashtag for eBay’s recent developers conference, #eBayDC10. 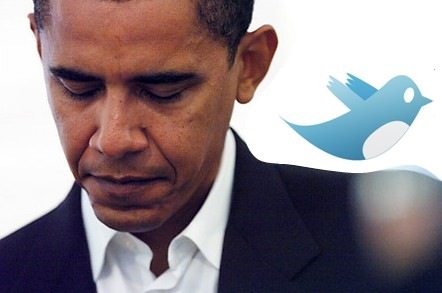 Bizarrely, though the conference had ended, there were several tweets about it not having happened yet. Bizarre. Of course, this is now a cat-and-mouse arms race, escalating the conflict between the virtuous Twitterers, and the despicable spammers that want to profit off everything. And even writing down this list will help the spammers, as a number of these items are easily resolved, such as adding in additional stolen information for web, bio, and location links, creating more varied tweet schemes, and automating via the web instead of API. Why are moaners jerks? Because they’re not adding anything to the conversation, they’re merely causing strife because they can. Even when they see the problem coming, what do they do in their moment of power? Whine, warn, and admonish? If everybody recognizes the problem already exists, they’re just stealing valuable time and air when we could be getting real work on a solution done. If nobody else recognizes the problem, then what they should really be doing is trying to convince. Convincing is not restating your assessment of the situation repeatedly in louder and louder words. I’ve been there, it doesn’t work. Really. Now, you can read the “con” prefix as an “intensive” so the word means “to conquer resolutely”, of you can read the other meaning as “with”. This would change the meaning of convince to mean “mutual victory”. In order to win this fight, you’re going to have to work with your opponent and come to a mutual conclusion. This may mean changing your method, your media, your language or even your dress if it’s important enough. Just because you are right, doesn’t mean anybody has to listen to you. Any more than you are required to listen to them. Al Gore is not a jerk, because he believes we’re destroying our planet with greenhouse gases, and he’s doing something about it. To get his message across, he created a new piece of media in the form of a lecture and a movie, accessible to entirely new audiences. He did this while maintaining his credibility with a different generation, by dressing in a suit and tie to deliver his message. Clever, eh? Because ultimately, what good is “knowing” what’s going to happen, if you don’t do anything about it? The “I told you so”, is a joyless victory shared by gumbling I-told-you-so-er’s on the porch of a house in a world they saw coming, and did nothing to stop. And what do we call these things anyway? PDAs? Handhelds? Since 1999, I’ve had 4 devices with a touchscreen, which ostensibly keep track of what I should be doing, but usually were just a way for me to read the news. The PalmPilot and the iPod/iPhone may not look related, but Apple owes a lot of “inspiration” to Palm. The concept of “swipe”? Palm did it first. Installable apps, check. No qwerty? Check. No multi-tasking, but fast switching? Check. No directory structure of files? Check. Clean-slate designed experience? Check. If you think installable apps are the sole invention of Steve Jobs, think again. Palm had thousands of developers writing a myriad of apps for their platform, even if they never really grasped the concept of supporting a sanctioned app store. Because of this, various 3rd party sites sprung up to support the app market, (including individual developers), leading to a fractured marketplace. On the far left is my venerable PalmPilot Professional. Released in 1997, it still merrily springs to life with a fresh set of 2 x AAA’s and gleefully powers the 160×160 pixel monochrome screen in the deep-purple/light-green scheme that I remember. This was my introduction to handheld computing, and the best thing about this device? Battery life. I could literally go 3 months on one set of non-rechargeable AAAs. My Sony Clie from 2002 was a replacement for my PalmPilot, with a sharper display and more memory. Honestly, if this device had wifi, it’d still be very serviceable today. There’s even a native Facebook app and a perfectly usable web-browser which can be used to access any current mobile site. With the iPhone, Apple brought to the table a responsive processor, delicious graphics, a refined input method, and a rationalized app store. I would say that the iPhone/iPod Touch is the spiritual successor of the Palm line, just better. I haven’t had a chance to demo a Palm Pre, but it looks like that’s what they were going for. On the far right is my latest communicator, the Nokia 5800 Music Express Navigation Edition. Let’s be clear, this is no iPhone 3G, not by a longshot. Why? all the things I mentioned above as improvements to the Palm line that Apple has done, none of them are part of this device. It’s slow, dark, tedious, and has a very poor app store. So why’d I buy the Nokia 5800? The most obvious difference here is price. An unlocked iPhone 3G is between $600 and $700. The Nokia 5800 MusicExpress Navigation Edition only cost $250. And since I was already carrying the iPod touch with me everywhere, the Nokia just has to stand in when I actually want to receive a call, navigate via GPS, or take a photo. And if I get really desperate, I can always use the wifi sharing to give my 3G connection to the iPod Touch and get some real work done. how can I be more innovative? how can my company innovate more? In that question there is another question hiding, is “innovation” something born, or something bred? Can you learn to be innovative, or only ‘have it from the start’? Innovation is the combination of both the knack, and the skills. With the knack only, you will get great ideas and fail to make anything come of them. With the skills only, you will be forever waiting for inspiration. In the corporate world, we often see companies with the skills, but no knack for great ideas slowly wasting away into mediocrity. This is a problem of selection bias, as few companies with great ideas and no skills ever progress beyond conversations in the pub. The few who are left, if stagnating in their industry, are clinging to optimizing one good idea they had a long time ago. Individual innovators and innovative companies share something in common: the capacity to embrace the trend-setting, mold-breaking, mind-bending concept brought forth in innovation and then execute on that idea with passion, flair, and speed. If you want to build amazing houses, you need amazing architects, and amazing builders. Whether by accident or intent, successful innovative companies and innovative individuals have found a way of balance both the nature and the nurture of great ideas. The incredible is heard with welcoming ears, prioritized against the current goals, and swiftly put in place if possible. Having the idea is one step, making it happen is another one all together. Luckily, great ideas and innovators are easy to spot if we know where to look (just look for wild gesturing and a fire in their eyes); and once we know who they are, we can build a team around them if need be. As both employers and employees, we can focus on the setting up the structure upon which great ideas can happen; helping the nature along with a little nurturing of our own.